With the installation of our energy-efficient double glazing, you can keep the warmth inside your property while preventing the cold air from getting in. All Kent Windows Ltd ensures that your property remains warm, and that your energy bills are not sky high, by providing quality, efficient, double-glazed windows. Welcome guests and visitors into your property through our beautiful doors. Our extensive range includes styles and designs to suit all tastes and budgets. There are a wide variety of products that combine together to make up your roofline. Ensure that they are of the highest quality by purchasing them from us. Add value to your home while also enjoying a bright, comfortable, and beautiful property extension thanks to our proficient conservatory installation. Contact our domestic installers now, in Belvedere, Kent, to acquire more information about our home improvements. 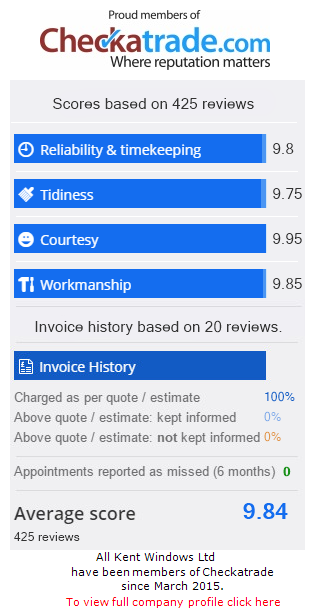 Choose the experience of our domestic installers to make the overdue home improvements that you need. All Kent Windows Ltd, in Belvedere, Kent, is a long-established company with more than 30 years of industry experience. Offering generous ranges of windows, doors, conservatories, and roofline products, our team pay meticulous attention to detail to preserve the high standard of our services, while we strive to maintain low prices. In order to supply the highest quality of products, we have become an authorised partner and registered installer of REHAU™, as well as being a Legend 70™-authorised installer. All of our clients are able to secure expert advice on the best glazing solution for their needs.